Chocolate and hazelnut were made for each other. The flavor of hazelnut is strong enough to come through even the richest of chocolaty notes, and the mild sweetness of the nut mellows any bitterness of the dark chocolate. 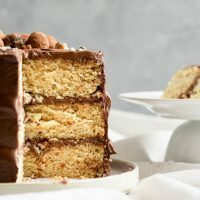 And in the cake itself, the hazelnut plays well with vanilla, elevating a simple white cake to something extra special. The whipped ganache makes for a slightly messy and rustic finish, and the swirls and ridges formed during decorating can be emphasized for a lovely effect. This shouldn’t be the frosting choice for perfectionists, as you aren’t guaranteed to get the crisp lines and smoothest of finishes. 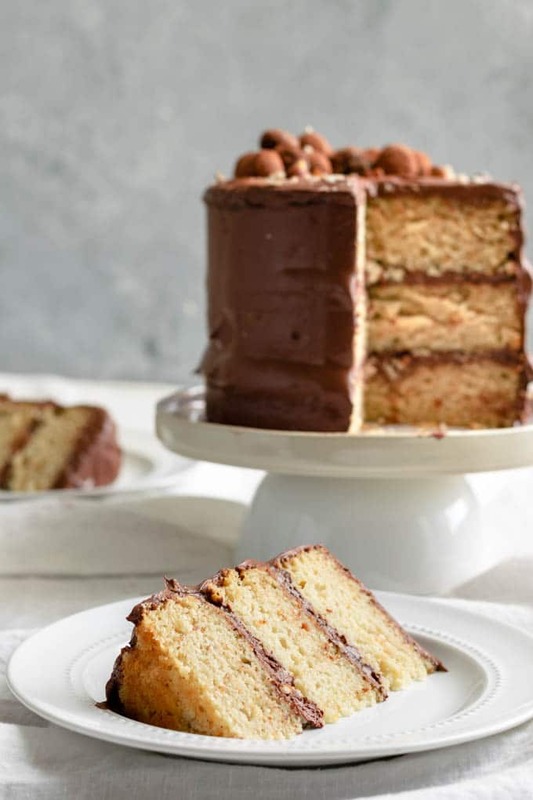 But it is the perfect frosting for this sweet and nutty cake. The ganache is almost bittersweet, made mostly of dark chocolate with just a couple spoonfuls of sugar to balance the flavors. Coconut milk turns the ganache extra creamy, and it’s high (saturated) fat content helps set the chocolate to it’s final thick texture. 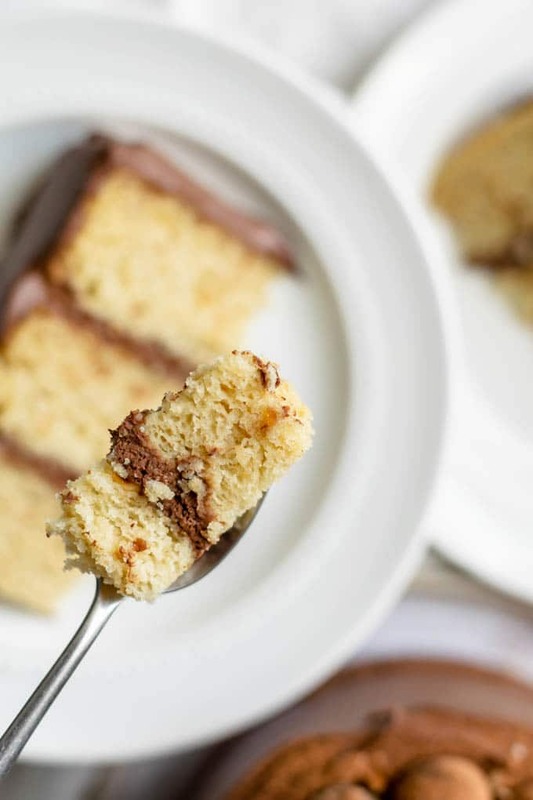 A pinch of salt enhances the sweet and a splash of hazelnut liqueur makes the frosting a bit nutella-esque. To begin making this dessert masterpiece (for it’s a masterpiece in flavor if perhaps not in looks), we must make the cake. First, decide what size cake you want and how many layers. Pictured here is a 3 layer 6″ cake. As I only have two 6″ pans this means I make the cakes in 2 batches. I’ve written the instructions for one 6″ cake or two 6″ cakes (which is the same amount of batter as one 8″ cake) so you can make the cake size and stack you’d like! At least, within the confines of those two sizes haha. Making these cakes is super simple. First, we toast some hazelnuts (325 ºF for about 15m, stir once or twice). Toasting the nuts brings out more of their flavor and softens the nuts. Toasting also causes the papery skin to loosen and start to burn, so after toasting we wrap the nuts up in a towel and roll them around, which removes most of the skin. Grind the appropriate amount of nuts up in a food processor (how much you need depends on how much cake you’re making, but in general 1 cup of nuts = 1 1/4 cups of ground nuts) to make a meal. The toasted nuts don’t grind as fine as the raw nuts, and they tend to clump a bit more, but I love the extra flavor toasting brings and I love how you can see the flecks of golden brown in the crumb of the finished cake. Once the nuts are prepared we can make the cake! It’s adapted from my easy vegan vanilla cake so for more vegan cake baking info check out that post. To start, always turn on your oven to preheat and prepare your baking pan(s). Then, clabber the non-dairy milk with some apple cider vinegar to make a quick buttermilk. Soy, oat, and almond milks work best. The milk will take 5-10 minutes to clabber, so go ahead and mix together the dry ingredients while you wait. Whisk together the flour, hazelnut meal, sugar, salt, baking powder, baking soda until well combined and fluffy. Then go back and add the remaining wet ingredients (hazelnut liqueur and vanilla extract) to the clabbered plant milk before adding that to the dry ingredients. Whisk it all together to form a smooth batter, transfer to the cake pans, tap it a couple of times on the counter to release any bubbles then bake! The cakes should be cooled fully then wrapped in plastic and refrigerated to thoroughly chill before decorating. Chilling the cake makes it less sticky and crumbly when cutting the cake to level or torte (cut a cake in two or more layers) as well as causes less crumbs when frosting. Making whipped chocolate ganache is super easy, but it’s not the speediest frosting to make. All you have to do is chop chocolate, warm coconut milk with some sugar and salt then submerge the chocolate in the hot milk. Let time do it’s thing for the chocolate to turn melty, then add a splash of hazelnut liqueur and whisk it to a smooth ganache. Use electric beaters or a stand mixer to whip the ganache until it’s fluffy and a shade or two lighter. It makes a soft and decadent frosting, that’s addictive to eat. Putting together these cakes is an easy task! 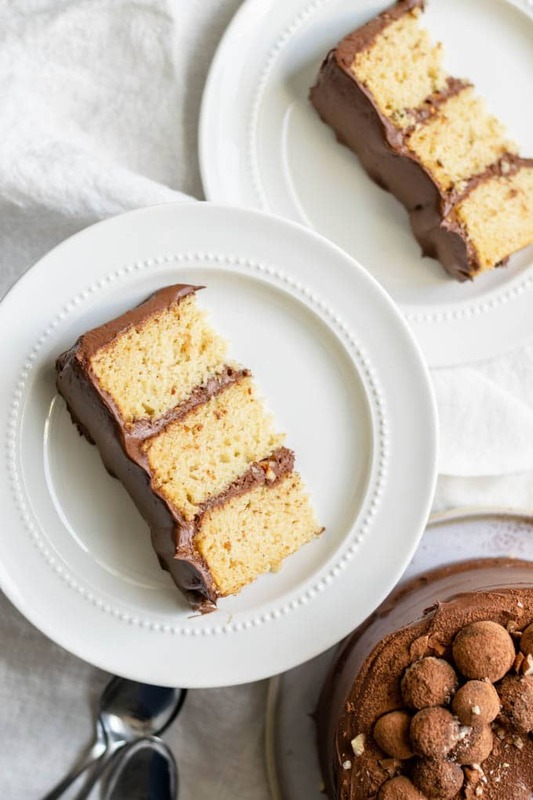 Level off the tops of the cakes using a bread knife or cake leveling tool, then starting with the first cake, add thick layer of ganache overtop. Sprinkle the chocolate frosting with chopped hazelnuts, then stack the second cake on top of the first. Repeat on a third layer if you’re making a three layer cake. To make the top of the cake flat, flip the cake when adding it to the stack so that the bottom of the cake faces up for the second, third, and any additional layers. 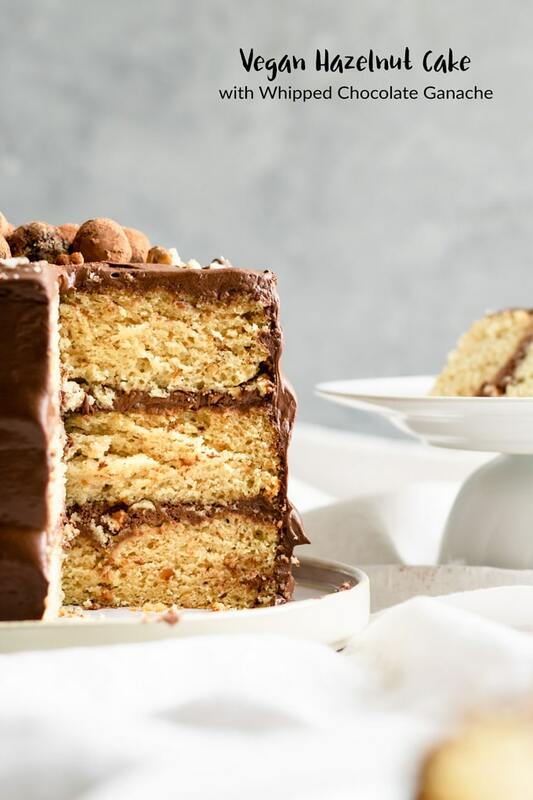 Once the cakes are stacked with ganache and nuts between the layers, frost the top and sides of the cake with plenty of ganache. Make swirls in frosting as desired. Add more ganache and remove as you’d like, this is a forgiving frosting to work with. If at any point the whipped ganache gets too soft (this can be more problematic during warmer months) you can stick it back in the fridge to firm up. To finish decorating the top of the cake I made my vegan chocolate hazelnut truffles, skipping the part where I covered them in tempered chocolate and instead rolled some of them in a dusting of cocoa powder and others in finely ground hazelnuts. I put some truffles on top of the cake, then sprinkled more chopped hazelnuts over top. You could also dust with some cocoa powder for a pretty finish that hides imperfections, or get fancy with a piping bag and made some border designs with the whipped ganache. However you decorate this cake it’s sure going to delight anyone who is lucky enough to eat it! It’s such a perfect cake! It would make for a beautiful dessert for any of your holiday celebrations! 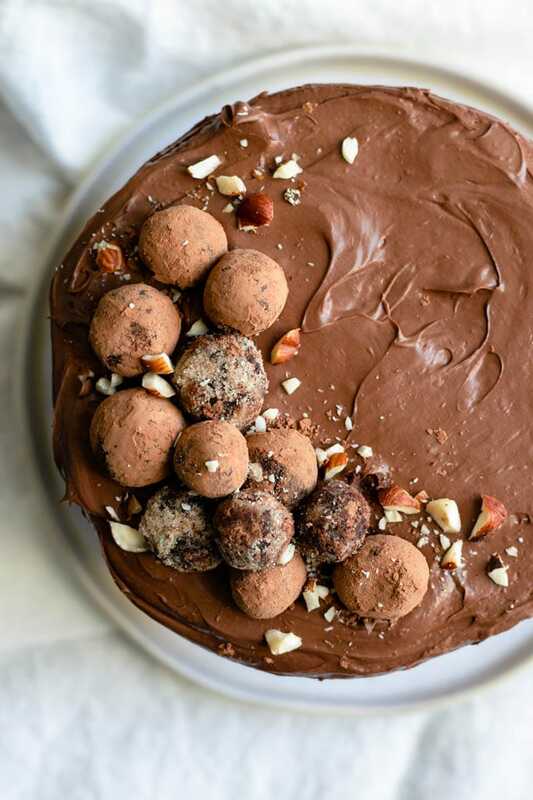 If you make this vegan hazelnut cake with whipped chocolate ganache, leave a comment and give the recipe a rating on the recipe card below! Also don’t forget to share your creations with me on Instagram, tag @thecuriouschickpea and #thecuriouschickpea, I absolutely love seeing your photos! If you’re in a hurry to get the finished cake out, make the ganache first as it takes more time to set than the cakes do to chill. 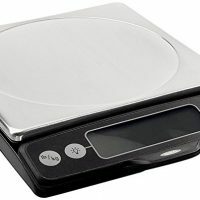 For best results, weigh your ingredients! I used Frangelico for the hazelnut liqueur. Use a high quality liqueur (i.e. don’t substitute hazelnut schnapps please), as you want that perfect nutty flavor in your final dessert! You probably can substitute hazelnut extract (you would use a lot less) but I haven’t tested it. This most delicious vegan hazelnut cake is topped with a whipped chocolate ganache. The moist and tender crumb and fluffy rich ganache are a perfect pair! 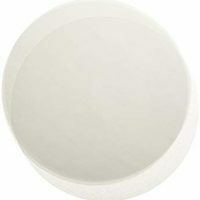 Preheat the oven to 350 ºF and prepare your baking pan(s) by spraying them with oil, then placing a circle of parchment paper to cover the bottom. In a small mixing bowl combine the apple cider vinegar and plant milk and set aside for at least 5 minutes. In a large mixing bowl whisk together the flour, hazelnut meal, sugar, salt, baking powder, and baking soda until well combined. Mix the oil, hazelnut liqueur, and vanilla extract into the clabbered milk, then add the wet ingredients to the dry. Whisk to combine and until the mixture is smooth (minus any larger grinds of hazelnut meal). Pour the batter into the prepared pan (or divide in half if baking 2 cakes). Bake the 8" cakes for 35-37 minutes, bake the 6" cakes for 27-29 minutes. The cakes are done when the edges are golden and have pulled away from the sides of the pan and a test comes out clean or with one or two crumbs. Remove from oven and let cool for 10 minutes. Then working gently set a wire cooling rack over the pan and turn the pan upside down to release the cake--shake or tap gently to help release if necessary. Remove the pan, then peel off the parchment paper from the bottom of the cake before turning the cake back upright on a cooling rack. Allow the cake fully cool. 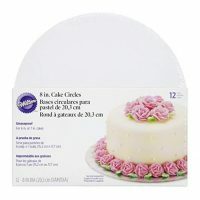 Place the cooled cakes on a cardboard cake board and wrap tightly in plastic wrap. Place in the fridge or in freezer-safe ziplock bags in the freezer until ready to decorate. Decorate cakes when cold for best results! Place the finely chopped dark chocolate in a heat safe mixing bowl. In a small pot heat the coconut milk, sugar, and salt until it comes to a low simmer. Stir occasionally to dissolve the sugar. When simmering, pour over the chopped chocolate and rotate the bowl to submerge the chocolate. Cover and let sit for 4-5 minutes. Add the hazelnut liqueur, then whisk the mixture until smooth. Allow to cool about 30 minutes at room temperature, then cover and place in the fridge--place plastic wrap to touch the top of the ganache to prevent it from forming a skin. Allow to thoroughly chill, at least 4 hours but ideally overnight. When ready to whip the chocolate will be thick, very firm, and can be scooped with a spoon. Transfer to the bowl of a stand mixer or a large mixing bowl and whip the ganache until light and fluffy. This will take 2-5 minutes depending on your machine! Use immediately to decorate your cakes. If the ganache gets too runny it probably wasn't chilled enough and put it back in the fridge until ready. *To make hazelnut meal: toast hazelnuts at 325 ºF for about 15 minutes, or until the nuts are fragrant and a shade or two darker. Wrap the toasted hazelnuts in a kitchen towel and let cool for a few minutes. Then rub the hazelnuts in the towel to remove most of the papery skin. Don't worry about any that doesn't come off. When fully cool, grind nuts in a food processor to form a meal. Note: 1 cup whole hazelnuts = 1 1/4 cup ground. *To measure your flour by volume: whisk the flour in the container to undo any settling, then scoop with the measuring cup and level with the back of a butter knife. *I used Frangelico for the hazelnut liqueur. 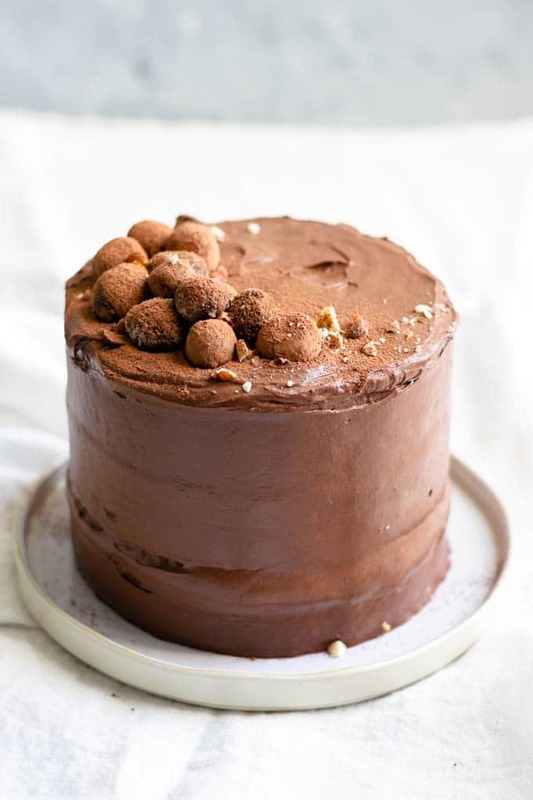 *To decorate this cake I added chopped hazelnuts over the ganache between each layer as well as sprinkling some on the top of the cake. I also topped it with vegan chocolate hazelnut truffles, coating some of the ganache centers in cocoa powder and others in ground hazelnuts for an easy finish. It looks amazing Eva!! I love hazlenuts and that ganache looks sooo tasty! I must make it ASAP!! 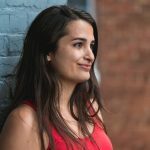 Why are there 13 cow milk adds on your beautiful vegan site?? Hi Karen, I’m sorry about the cow’s milk ads and thank you for bringing it to my attention. I do try to block non-vegan ads but unfortunately when it comes to dairy and the dairy alternatives these are not separated and it’s all or nothing. I’m talking to my ad network however to see if we can figure out a solution to selectively block the dairy ads, and hopefully ad servers catch up with our needs soon! Just made this cake and it was fabulous, moist and nutty. Thanks for sharing this dilicious vegan cake recipe. This sounds like such a delicious combo! I’m glad you enjoyed the cake! The only thing I’ve made from scratch that didn’t come out disgusting is a cheesecake and now this cake! I Just made this cake and it was very easy to make. The yellow cake is delicious and the ganache is sooo rich and yummy! I put the ganache in the freezer for about 45 minutes because I’m just that impatient and luckily it was not runny when I applied it to the cake. Amazing recipe thank you so much for sharing! Hi Aniema, I’m so glad you enjoyed the cake! That’s great to know freezing for a bit sped up the process with the ganache. Thanks for reporting back!